Salesmanship can be a dirty word in many people's minds because of the negative connotations associated with it. When we think of a “Salesman”, we think of someone who is greasy, deceptive, profit-driven, vacuous, and dishonourable. Salesmen are those annoying pests who talk too much, listen too little, lie with intent, take your money, and then vanish into thin air cackling like witches, right? Let’s get real here and admit that's childish nonsense. To “sell” something is to convince another person that that thing has value, and that its value is sufficient to justify them making a financial sacrifice to obtain it. We all have something to sell, and often the things we are most passionate about can be sold to fellow enthusiasts for great reward. You want to make money by doing the things you're passionate about, don't you? Doesn't everyone? The internet has made it so that anyone can do just that with a little experimentation, imagination, and preparation. In this brief work I expand upon 5 simple questions which you must learn to answer when selling or promoting your work, whether that work is a book, a painting, a product, an invention, a service, a program, or an idea. Included are some useful graphic exercises and examples from real businesses who have lived and died by their preparation, or lack thereof. Have the courage to turn your passion into a source of income by developing well-researched answers, and actionable plans, to the questions in this book. Get it in either eBook or print copy on the WOODKERN Store, Amazon, or Kindle. "Unchaining The Titan" is an engaging collection of essays, each of which evaluate ancient wisdom using accessible language for the modern reader. 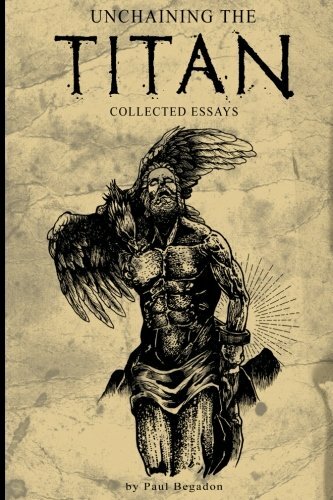 Each essay stands alone and promises to offer the reader practical lessons to improve your social, psychological, spiritual, and professional well-being by making relevant comparisons between your modern life and the archetypal characters in old myths, legends, historical events, and even some modern film and literature. The book makes use of archetypal patterns of behavior as embodied by characters in fascinating stories from the past to teach you time-tested methods to improve the quality of your thinking and the effectiveness of your actions by understanding the universal truisms which have been passed down to us through ancestral parables and folktales. The book is currently on its second edition of publication, although copies of the first edition are still available in very limited quantities. The second edition is has been revised to be more clearly expressed and also includes essays, poems, and customized artwork which do not appear in the first edition. Click the links in the text below to view different versions of this book, which is guaranteed to give you significant insights into patterns of archetypal behavior which will empower your life. The book is available for purchase on Amazon, and signed copies can be purchased via the WOODKERN Store. Digital copies are available to download from Kindle and via the WOODKERN Store.